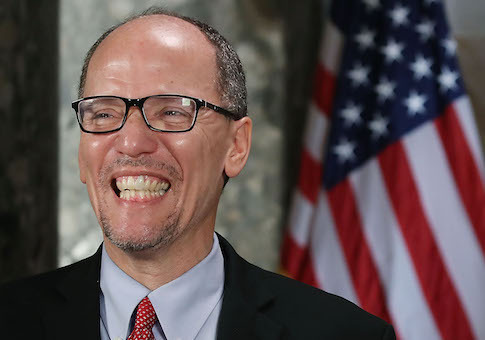 Democratic National Committee chairman Tom Perez transferred large sums of money to a former rival's campaign after he dropped out of the DNC chair race and endorsed Perez. Former South Carolina Democratic Party chairman Jaime Harrison dropped out the race for the DNC chairmanship only days before balloting. IRS filings show that a month later, Perez's campaign committee transferred $22,270 to Harrison's campaign, paying off his entire debt, Politico reports. NBC News reported during the race that Harrison "was said to have had the third largest number of votes committed to him in a crowded field," and that his endorsement "might be enough to put Perez over the top on the first round of voting." Harrison is now associate chairman and counselor of the DNC. Perez's campaign also paid $5,000 to the campaign of Texas Democrat and political commentator Jehmu Greene. Like Harrison, Greene dropped out of the race days before the first vote and endorsed Perez. Harrison denied that he discussed money with Perez before giving him his endorsement, and said an offer was made only after the race was over. "Tom's staff—which is very gracious of them—asked if they could be helpful," he told Politico. The DNC also denies there was anything unseemly about the money transfer. "Tom had left over funds after the DNC race and was happy to help the other candidates who asked for help with their campaign debt," a spokesman said. But New Hampshire Democratic Party chairman Raymond Buckley says he was never approached about paying off his debt. He also dropped out of the race, but endorsed Perez's rival, Rep. Keith Ellison (D., Minn.). This entry was posted in Politics and tagged DNC, Jaime Harrison, Tom Perez. Bookmark the permalink.